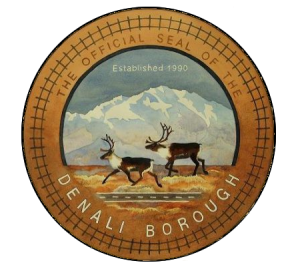 The Denali Borough, gateway to Denali National Park, is located 250 miles north of Anchorage, and 110 miles south of Fairbanks. The borough embodies the best of Alaska: over 12,000 square miles (8.2 million acres) of extraordinary scenic and wild country, the highest mountain on the continent (Denali: 20,320 feet), extensive and productive natural resources, a diverse economy, and approximately 1,900 year round residents. The Denali Borough was incorporated in 1990 and contains four recognized communities: Anderson, Healy, McKinley Park, Cantwell, and a number of smaller settlements. These communities are all located in proximity to the George Parks Highway, the major north-south highway corridor within the state. The Alaska Railroad also bisects the borough and serves the communities of the borough.